Quad HD / 4 MP, AXIS M3046-V provides exceptional video quality at an affordable price. 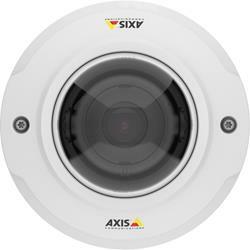 AXIS M3046-V is perfect for stores, hotels, schools, banks and offices. And it features an HDMI output for live streaming to a public monitor. AXIS M3046-V gives you sharp Quad HD video quality. It provides a horizontal field of view of 128°. And it comes with Wide Dynamic Range (WDR) technology for good detail even when light levels vary. Thanks to digital pan/tilt/zoom (PTZ) capabilities and multi-view streaming, AXIS M3046-V lets you view separate video streams of zoomed-in sections of an image at the same time as you view the full overview image. This can be done with a single camera, which keeps installation and maintenance time and costs low, plus minimizes bandwidth and storage needs. AXIS M3046-V can also be used as an alternative to a camera with varifocal lens - its 4MP resolution and digital PTZ capability enable sharp, cropped out views in HDTV 1080p, for example, with a horizontal field of view between 95° and 128°. Small and compact, AXIS M3046-V can be mounted on walls or ceiling as you prefer. And you can easily repaint it to blend in with any environment. A black casing is also available as an accessory. To keep implementation costs low, AXIS M3046-V is designed for fast and easy installation. No focusing is required because it comes factory focused. And with its 3-axis camera-angle adjustment, it can be easily leveled and directed in any direction. AXIS M3046-V is also vandal and dust resistant for optimal performance and minimal downtime.